SPACE IC products are designed to operate in harsh environments. The achieved robustness and radiation hardness is a result of a robust circuit design without compromises combined with a well chosen fully isolated high voltage BCD SOI technology which is latch-up immune and known to mitigate Single Event Effects (SEE). All SPACE IC products have been Total Ionization Dose (TID) and Single Event Effects (SEE) radiation tested and are subject to screening and qualification according to ESCC. The products are offered in well-established hermetic ceramic packages suitable for space applications. SPACE IC high reliability products are developed and manufactured in Germany and can be delivered ITAR/EAR-free worldwide. ITAR (International Traffic in Arms Regulations) and EAR (Export Administration Regulations) are a set of United States government regulations that control the export of defense-related articles. Especially the procurement of radiation-hard IC products from US suppliers suffers from high bureaucratic efforts, long lead times and high delivery risks. 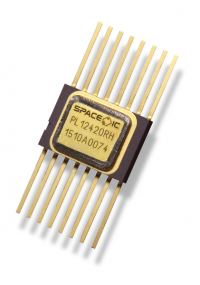 SPACE IC products guarantee short lead times and planning reliability in space programs. Please contact us for parts availability. The SPPL12420RH is a radiation hardened monolithic synchronous buck regulator featuring integrated 110 mOhm MOSFETs that provide continuous 2 A output load current. Its current mode control circuitry provides fast transient response and cycle-by-cycle current limit. 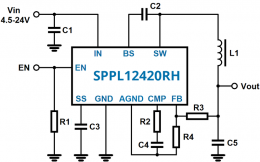 The SPPL12420RH can be operated at input voltages up to 24 V, which is the derating reference. The SEE-related limitation of the input voltage depends on the target LET level. The device is packaged in a hermetically sealed 16-pin flatpack with heatsink and straight leads. The SPLVDS032RH is a radiation hardened 400 Mbps Quad LVDS (low voltage differential signaling) Line Receiver optimized for high-speed, low power, low noise transmission over controlled impedance (approximately 100 Ohm) transmission media (e.g. cables, printed circuit board traces, backplanes). The SPLVDS032RH accepts four LVDS signals and translates them to four LVCMOS signals. The outputs can be disabled and put in a high-impedance state via two enable pins, OE and OE*. The SPLVDS032RH input receivers support wide input voltage range of -7 V to +12 V for exceptional noise immunity comparable to RS-485. A fail-safe feature sets the outputs to a high state when both inputs are open or undriven. Supply current is 7 mA (max). The LVDS inputs conform to the ANSI/EIA/TIA-644-A standard. The SPLVDS032RH is offered in 16-lead flatpack package and operates over an extended -40 °C to +125 °C temperature range. The SPLVDS031RH is a radiation hardened 400 Mbps Quad LVDS (low voltage differential signaling) Line Driver optimized for high-speed, low power, low noise transmission over controlled impedance (approximately 100 Ω) transmission media (e.g. cables, printed circuit board traces, backplanes). 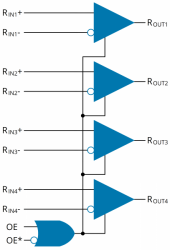 The SPLVDS031RH accepts four LVCMOS / LVTTL signals and translates them to four LVDS signals. 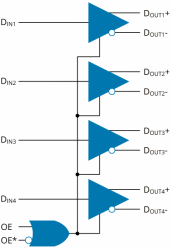 lts differential outputs can be disabled and put in a high-impedance state via two enable pins, OE and OE*. Low 300 ps (max) channel-channel skew and 250 ps (max) pulse skew ensure reliable communication in high-speed links that are highly sensitive to timing error. Supply current is 23 mA (max). LVDS outputs conform to the ANSI/ EIA/TIA-644-A standard. The SPLVDS031RH is offered in 16-lead flatpack package and operates over an extended -40 °C to +125 °C temperature range.